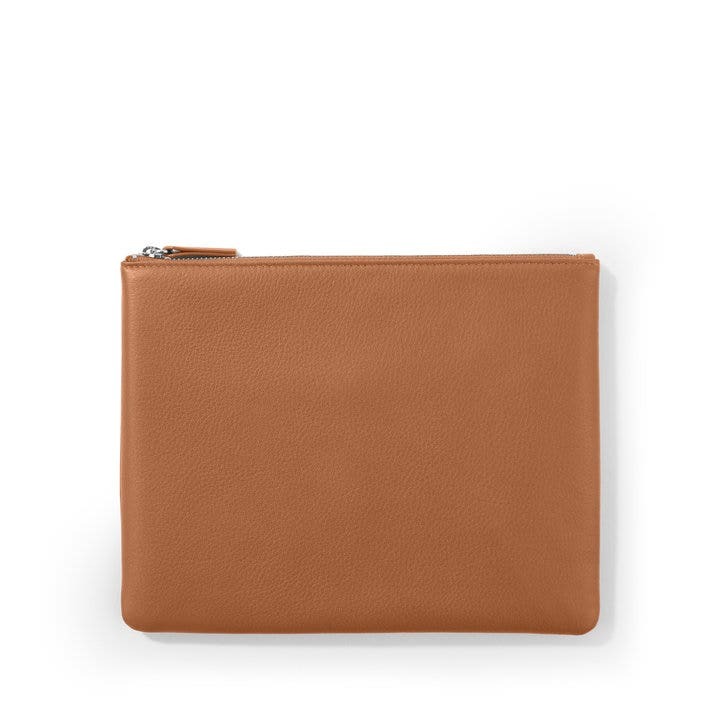 Super simple and versatile, the Medium Pouch is a low-profile pouch that can hold all you need on the daily. From keeping phone chargers and ear buds contained in your work bag, to storing key travel documents in your carry-on luggage, this style can hold anything you need it to. Made with a flat construction, this leather pouch will never bulk up your bag. Ordered 15 of these for an event gift and they turned out SO well - Leatherology team (shout out to Kristen) was fantastic in working with my timeline and getting me a gorgeous product that will absolutely represent our brand in the best light. Service, quality, and beautiful product - what more could you want? I gave this to my daughter in law who has four young children and carries a large purse and/or diaper bag. It is beautiful and very practical for anyone who carries a large purse and needs to be able to find phone/lipstick etc. quickly. Beautiful leather and fast delivery! Beautiful leather and exceptional craftsmanship. This our third purchase and will continue to come back. We got this as a gift for my cousin to use on her wedding day. It was perfect and beautifully packaged. She loved it! Got as a gift for a wedding day pouch. Perfect size for the essentials and absolutely beautiful!! I am so excited to give these to my bridesmaids on my wedding day! I own the bride pouch and love it. So fun to personalize with their initials. I bought this to use for my wedding weekend. I wanted something to throw some $, phone, and lipstick in. This has plenty of room, good quality leather with a sturdy zipper, and is a beautiful neutral blush color. Everything was beautifully wrapped, boxed, and mailer package, all very high-end. The pouch itself is excellent quality - love the charcoal color. I highly recommend Leatherology, they will always be my go-to leather shop! I ordered the medium pouch and a matching key fob, both with initials, for my daughter's birthday. They were perfect.